If you work with customer feedback, you have probably already noticed this trend: more and more companies are analyzing text feedback with text analytics. What is text analytics and why is it so relevant in today’s world? If you are in a big company with a large number of customers (or users), you most probably receive a lot of customer feedback: people write about their experiences, complain about the things that do not work and tell about the things they love. Most companies collect feedback in some specific format, such as Net Promoter Score. Some companies use other metrics, such as Customer Effort Score or Customer Satisfaction. If you’re interested in the topic, check the full list of most popular CX metrics. These standard metrics include not only the number but also free text feedback revealing why your customers like or dislike you or your product. Feedback arrives in other forms as well: pure text sent via various channels directly to the company, comments on social media, reviews in application stores and online stores etc. When your customer sends you their feedback, they expect it to be read. They expect to be treated individually and respectfully. They expect actions and communication. But it might be easier said than done – you might get a lot of feedback. And we mean it. You might get even more feedback than you can manage. Many companies receive thousands of rows of feedback per day. And even if you received only some tens or hundreds of feedback items per day, you still don’t necessarily have the resources to read everything through and process it manually. And there is another problem. Even if the feedback is read, it is not necessarily aggregated into leadership level in a way that would enable management decisions. Even if your customer service agent or customer insight analyst reads all the comments and even responds to them, do you know what decisions you need to make in the leadership team? Part of the problem results from the sheer volume of data. But the volume alone is not making the problem a very complex one. Instead, it is the unstructured nature of the data which makes it challenging to tackle with any traditional means of analytics. It is a challenge to find meaning in a data that is text-heavy. This situation is where automated text analytics is brought in: it can help in sorting out the key topics talked about and reveal the general sentiment per topic. What is Text analytics (Text Mining)? …and why is it so relevant in the context of customer feedback analytics? Text analytics includes a set of techniques that structure information arriving in text format— in this case, free text customer feedback. The purpose is to convert unstructured text into meaningful structured data to support business analysis and decision making. A topic analysis reveals topics that are most talked about. Sentiment analysis involves analyzing subjective material and extracting attitudinal information. Simple sentiment analysis divides the sentiment into three buckets: a sentence can be positive, neutral or negative. Machine learning technologies can detect the degree of sentiment as well: if someone hates your product, the negative sentiment is stronger than if he just dislikes it. Similarly, if someone loves your customer service personnel, the positive sentiment is stronger than if they just feel it’s good. If you do text analytics in the context of customer feedback, what you typically get is topic volumes and volume trends and a sentiment for each topic. If there is a lot of data, the categorization can be a very detailed one: instead of personnel the categories can separate customer support personnel from sales personnel or divide the feedback about personnel in comments about their behavior, knowledgeability, responsiveness etc. Careful and well-implemented text analytics can easily reveal dozens of improvement ideas. Based on the text analytics you would know that the people talk negatively about your customer service response times, the info available on your website, the attitude of your sales personnel, the features of your latest product release etc. But the management doesn’t care about all the 100 things that someone is complaining about. They need to know what are the top-3 improvement needs. Which one should be tackled first? Is it important enough to justify the cost related? Basic text analytics is helpful, but it is not enough. Frequencies and volumes (what is being talked about) do not fully reveal how important things are. Even if you know the sentiment (if the feedback is positive or negative) you still don’t know how important things are. Shortly, the results are not actionable. Read more about the role of Artificial Intelligence in text analytics. When thinking about feedback collection or any data and analytics activity within the company, a key thing to keep in mind is that the value of analytics is only realized when the analytics impact decision making and actions are being done. Therefore, basic text analytics is only the first step between data and value creation. 1) Better, more insightful text analytics to understand the most relevant drivers for customer experience improvement. The results must be meaningful from the business perspective and reveal the critical improvement needs. 2) Fact-based decision making considering not only the customer experience drivers but also the financial cost and benefit of the proposed actions. 3) An organization empowered to act on feedback. 4) And most importantly, improvement actions in various parts of the company. Text analytics is actionable if it supports decision making in an optimal way and if the results of the analytics can be shared in a way the organization is empowered to act. Text analytics tools are different. Some cluster and categorize data from bottom-up, while some categorize sentences to the pre-defined categories. Both approaches have their merits. The first one can more easily reveal new topics organically. The latter one can be more fluently directed to support decision making. Why is that? If the business can influence the structure of categories used in text analytics, they are understandable and relevant for the business. They are not meaningless. One of our customers, who has a long experience working with other text analytics providers, complained that the top categories in their data are always their own brand and customer service. None of these categories makes any sense to them. When we define categories top-down, we can skip these meaningless options and include only ones, which are somehow actionable for the business. Example on categories and sub-categories. Do you see what drives customer experience? Maybe the customer service category is not useful as such, but the company wants to follow how people feel about the service response times, issue resolution and the knowledgeability of customer service personnel. The brand itself is seldom a useful category, but any commentaries where it is compared to the competitor brands can be useful. To support decision making, the text analytics results should allow follow up. This requires that the categories don’t just disappear organically. When a category can be followed up after an action has been done, the impactfulness of the action can be verified. If a category can just disappear organically, how do you know if it disappeared because your action was effective or because the data was just organized differently bottom up? It is clear that top-down categorization alone doesn’t guarantee meaningful business driven logic to the topics followed. It requires industry and business expertise as well. We ensure this by working closely together with our customers to ensure the vocabulary used in the categories matches that of our customers. The basics need to be right. If you use good quality text and sentiment analysis, you should at least know what your customers talk about. But that is just the first step. — I get this info that 22% of our customers are talking about our credit and debit cards. So what? What am I supposed to do with this data point? And they were right. No one can make much sense with a data point like that. What you need instead is a thorough understanding of the drivers – how each topic impacts the customer experience. How much higher is the impact of the high cost of credit cards compared to the impact of rude customer service? The key is to understand the relative importance of each topic – and how much each of them impacts your overall customer experience. Only that way you can start to make choices in a rational manner. Then what? If you know the top-three improvement areas from your customers’ point of view, you have already come a long way. Most likely you can plan on how to gradually start improving the things people most dislike. However, if there is a high cost involved, this might still not be enough. In companies, decisions are not purely based on what is best for your customer. The financial implications need to be understood as well. What you need is a business case. And the business case continues to be unclear if the leaders don’t understand the financial impact of the improvement. If the costs are high and the benefits are unclear or questionable, the action doesn’t make sense from a business perspective. The more explicitly you manage to establish the link between customer experience improvement and financial value, the better. This can be done by analyzing the historical performance of most and least satisfied customers, for instance, the churn rate difference between NPS detractors and promoters. How to link the NPS improvement efforts to the financial benefit in practice? Start by analyzing the difference in value between your detractors and promoters. Here, NPS typically has a very high correlation with retention: the happier the customer, the more loyal they are and therefore the more revenue they generate for you during their customer lifetime. Look at your customers’ behavior in history. Of the promoters, which you had 1 year ago, how many of them have stayed? How many have left? Most likely these numbers are very different for the detractors. When you have, based on the historical data, established a clear link between your customer experience metric and churn rate, you can immediately start to understand how big of a financial impact your X-point NPS increase has. A study done in London School of Economics in 2005 found that 7 point NPS increase led to an average 1% revenue increase. But you shouldn’t assume industry averages apply to you directly. There are huge industry-specific differences – in competitive industries, customer experience differences easily lead to a situation, where your customer decides to switch vendors. In industries, where consumers have very limited choice, they can stay as your customer for a long time even if they hate you. In B2B the user and buyer can be different persons and the decision-making dynamics therefore complex. Therefore, I warmly recommend knowing your own numbers. Keep in mind that there are also other ways the customer experience improvement impacts your bottom line. Higher NPS typically correlates with higher advocacy, which brings you more customers and revenue. Your most loyal customers also typically buy more from you. You have a chance to up-sell and again increase your revenue. The benefit can result from the cost savings as well. The higher your NPS, the smaller the number of customer complaints and returns. This can make you save in customer support and repair costs. To summarize, there are some standard ways through which NPS improvement (or customer satisfaction increase) translates to financial value. You should quantify at least some of these for your company. Once you have done that, you have a good understanding of what is the financial value of one-point NPS increase – that makes it easy to assess, whether a particular action targeted to drive the NPS up, makes sense or not. In addition to clever analytics and great understanding on what value you can get via improving your customer metric, there is one more critically important thing required, to make the feedback actionable: you need to empower your organization to make the changes needed. Empowerment requires a shared understanding of the issues, common targets to solve them and a company culture that encourages people to act – also across organizational silos. Text mining typically is the part of customer experience management, which is most clearly just for experts. Text mining and analytics tools are not being shared across the organization – and for a good reason. They are difficult to use and require expertise. 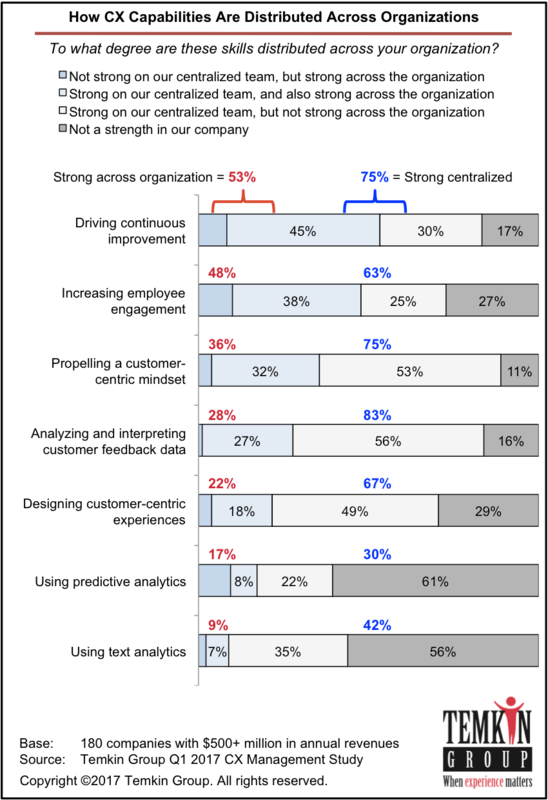 The recent Temkin study shows that the use of predictive and text analytics is the least distributed customer experience-related capability in the organizations. If you want to empower your organization widely to act on customer feedback, you need to be able to share the insights effectively across the organization. The problem when limiting the use of analytics tools to a very small number of people is that the improvement actions require involvement from various people in many parts of the organization. I have rarely seen a case where a very centralized analytics function wouldn’t have become a bottleneck in action planning. Typically, with high impact items, there are many teams and individuals who need to get together to make improvements. Therefore, the targets and understanding should be shared. Unless you have great resources in the analytics team, I recommend having an easy to use tool where anyone can see the insights and understand them. In addition, you need to empower your organization to act on the feedback. And an organizational culture that encourages people to act and co-operate across organizational silos. Analytics is just an enabler. But a powerful one if it provides insights people can act on. And when the data shows how the action led to an improvement in the experience, you end up creating a virtuous cycle: people will feel more and more motivated to act next time as well. Positive impacts, positive comments and positive changes after a problem has been tackled are extremely important for the employee motivation and the employee motivation highly impacts the experience your customers will have. Read more about who is responsible for customer experience management in a company. Actions also include engaging back to customers. Letting them know what has been done. Replying is not enough if nothing changes inside the company. And if the feedback has led to some concrete changes in the company, it is a waste of resources to not tell about it to your customers. It can be useful to separate the long-term actions, such as product development changes and process changes from short-term individual actions. In the former, aggregate data with good volume is needed. In the latter, good text analytics can help in better targeting messages on an individual level. The response can be instant. Similarly, automated text analytics can help to filter those individual comments, that require personal involvement. We often label these as “Critical comments” and include comments from people with a clear risk of churning. I don’t value one of these above the other. Both are needed. Facing your customer on an individual level makes them feel heard and respected. But they quickly realize if no-one is walking the talk. The frustration increases if they need to face the same issue when they interact with you next time. Therefore, the customer experience and customer feedback cannot be left to customer service to deal with. The most relevant feedback does require decisions made by the top management and some fundamental long-term changes. And while the changes on an aggregate level are important, you cannot expect your customers have the patience to wait until they have been implemented, if they are facing a very burning issue. Take both action types seriously to transform to a customer-centric organization. How to make customer feedback relevant on the C-Suite level? To summarize the long story short: just show them the value. The value of customer feedback analytics only realizes through decisions and actions. Therefore, the most important criteria, when choosing text analytics from a decision-maker point of view, is to ensure that the results of the analytics are actionable. Actionability is the result of analytics leading to concrete decisions and changes and actions within the company. The value of feedback is in the results. The value of analysis is in the actionability. Newer PostCustomer Feedback Is Never Just a Score. Older PostFrom Corporate World to Entrepreneurship: What Have I Learned?